Are you a outside novice, or seasoned kayaker looking to upgrade your current equipment? Outside Hilton Head offers an extensive selection of purpose-built kayaks ready to hit the water today. Kayaks are generally divided into the categories of touring, light touring, sit-on-top, sport, and pedal-drive. Both single and double kayaks are also available in these categories. Touring Kayaks are the longest and narrowest of all kayaks. They are the most efficient, meaning that more of the effort exerted through the paddle will transfer into moving the kayak versus strain on your body. They have smaller cockpits designed to give you more contact and control of the boat. Touring kayaks have lots gear storage and are shaped to handle a large variety of conditions. If you seek the easiest and best performing paddling experience, consider a touring kayak. A light touring kayak fits right in between a sport kayak and a touring kayak. A light touring kayak is a shorter and wider version of a touring kayak, but longer than a sport kayak. This gives a light touring kayak features of both types. It tracks well and has great stability. 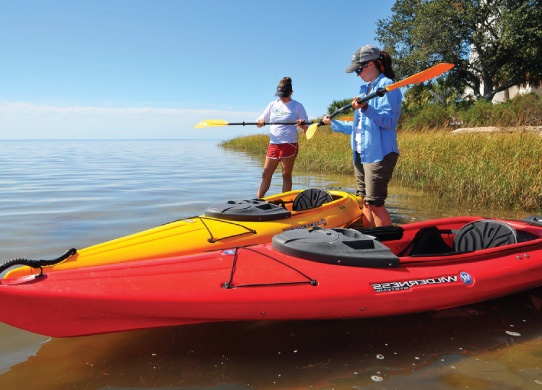 The sport kayak is a shorter, wider, kayak that allows for great maneuverability throughout the small creeks of our coastal marshes. It also has a larger cockpit that gives you easy entry and exit as well as a lot of room to move within the kayak. Sport kayaks are great for calmer waters and are usually a bit lighter that their longer relatives. The sit-on-top is a category of kayak that allows for water to drain out of the kayak, making it very user-friendly and well suited for most conditions. Often the choice of anglers, the sit on top is also a great kayak for those that live on the beach or for anyone that wants a very versatile boat. Hobie Mirage Pedal drive kayaks use a high tech system to transfer pedaling power into propulsion of the boat. These boats have the advantage of keeping your hands free, which makes them a favorite of anglers and photographers. Pedaling in a Mirage Drive kayak is about 30 percent more efficient than traditional paddling! The lighter and stiffer the paddle, the more you'll enjoy paddling and the more often you will go out! Materials determine the weight and stiffness with carbon, fiberglass and aluminum being the most common materials. Outside sells quality paddles from the best brands in the industry including: Werner Paddles, Aquabound, Harmony and Bending Branches. A USCG approved personal floatation device must be on each kayak and should be worn by each kayaker. 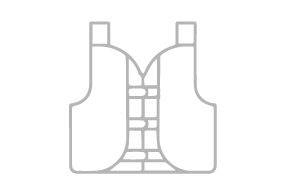 Your life jacket should be comfortable and adjustable, allowing you to wear it with a wide range of clothing for different enviromnets. We sell life jackets from Astral Buoyancy and MTI. Each kayaker is required to have a USCG approved noise making device. You should also have a paddle float, blige pump and first aid kit. At Outside Hilton Head we offer a full range of instructional opportunities that will allow you to get the most enjoyment out of your kayak!